Home HEALTH DOCTOR PROFILES Suki Subbiah, M.D. Maybe it was because “doctor” was one of her first words. Or maybe the Fischer-Price microscope kit she got for her fifth birthday did it. 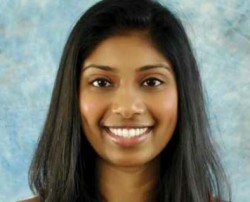 Having physicians in the family and being interested in science and math certainly didn’t hurt, and, just as she always planned, Suki Subbiah, M.D., graduated from the University of Florida medical school and completed her internal medicine residency and her hematology/oncology fellowship there in 2012. During her residency, her aunt was diagnosed with metastatic breast cancer. Her new position with LSU Hematology and Oncology allows her the opportunity to take care of lymphoma and blood cancer patients, while, at the same time, teach cancer fellowship students and work in research. Dr. Subbiah says there’s been such advancements in cancer care — even in the past four years since her fellowship — that an absolute standard in cancer care one day might become obsolete the next. It’s more than fine with her that the field is moving forward at such a good pace and that research is staying competitive. What doesn’t change, she says, is the “art of medicine” and the need to train fellows on delicate patient issues. The most important aspect is how to talk to patients about end-of-life care, one of the more challenging aspects of her job. It’s a goal she’s been aiming for since she first uttered that fateful word: doctor.